The Zodiac Sign Taurus Woman (April 21 - May 21), Taurus Personality Traits for Female born under April Zodiac signs. Taurus woman has all those wonderful feminine qualities that make her the queen of the heart and the dreaming range of absolutely any man. She is a very rare woman by her beauty and wisdom, who will be both a good employee, a beautiful wife and a wonderful mother to her children. Taurus woman always comports herself, she does not like to show extra emotions, especially in public. Without further ado, she creates a unique atmosphere of warmth and comfort, and people are drawn to her - for a calm communication, for the right advice, for warmth and understanding. She can easily compete with men in any affair that requires high moral and physical stress, but Taurus woman's wisdom is that she does not seek to dominate over men, and sometimes deliberately shows herself as a weak and defenseless person. Taurus woman may be capricious, and even cry, but she will never use her weakness to achieve in life certain privileges and indulgence. She controls herself well and finely regulates an interaction, trying not to offend anyone by chance and not to humiliate. Taurus woman has no excessive demands on friends and life partner, and always takes people as they really are. 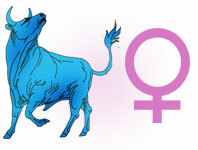 Taurus woman perfectly gets along with people, she is bright and sharp and decently comports herself in any society. Sure, she has aristocratic manners, and can engage in high society communication, but she finds it more interesting with ordinary people who do not have secular pomposity. Taurus woman is wise, her mind is practical, this is a natural wisdom, but she does not very eager to get an education or additional skills, if they are not needed by her to execute any affair. She never envies the successes of other people, and steadfastly praises others even his friends and partners, because she has a realistic and objective attitude towards all people without exception, leaving behind them the right to be something better than her. She knows her worth, and will not be unnecessarily worried or jealous of others' success because she too has a lot of talents and abilities. Taurus woman is not inclined to dream, that at times is inherent in woman's nature, she prefers the deeds and accomplishments that are always planned in advance. Her self-confidence is derived from her huge internal potential since she feels that no person can surpass her fortitude and perseverance. Taurus woman looks for common sense in everything that happen around her, and takes up an affair only when she sees its practical benefit. Go for broke in something, or move randomly - is not for her. Taurus woman is always a perfect hostess, she cooks well, knows how to keep the house, her house is always cozy and clean. She does everything slowly, but accurately and efficiently. In no case should she be stimulated and hurried, because she always knows herself how and what she should do. Taurus woman would never overindulge in jewelry or makeup, she prefers comfortable and very high-quality clothing of a simple breed without frills. This representative of the zodiacal circle loves children and will be a good loving mother, who not only cares about children, but will be an understandable friend to them. She is very welcoming, loves to receive visitors at home, but reluctantly visits others. For the husband, Taurus woman will become a reliable friend who will not only give him a strong rear but also be a reliable counselor in his affairs. Big emotions, whining, or swooning in happiness should not be expected from her, but she is not devoid of romanticism, and a man's life will try to put on an invisible aura of romance and cozy warmth. I am on the Taurus-Gemini cusp, and these qualities are very accurate. feeling very good to know more about me..thank u for this..very proud to have this zodiac sign to me..
OMG THIS IS ME ALL THE WAY AND NOW MY EX KNOWS WHAT HE LOST! Full description of Taurus Woman, character traits and personality characteristic for female Taurus.